The below artworks are the most important by Jean-Antoine Watteau - that both overview the major creative periods, and highlight the greatest achievements by the artist. Artwork description & Analysis: These two panels are a rare example of Jean-Antoine Watteau's early career as a decorative painter, and they are all that remain of a series of eight commissioned by the Marquis de Nointel. The other six panels, now lost, are known from engravings, and share similar light-hearted or sensual subjects (e.g. harvesting grapes, drinking, dancing, and other assorted follies) suggesting that the series may have decorated the dining room or breakfast room of Nointel's home. 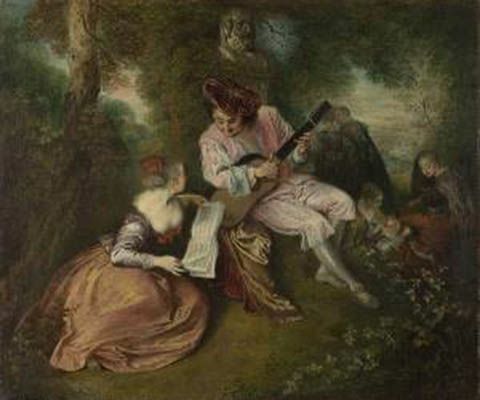 Artwork description & Analysis: In Watteau's romantic allegory, a young man theatrically dressed in soft pink silks plays a guitar in a wooded glade. He sits at the base of a pillar with a carved head on top (possibly "blind" Homer), his right leg extended and braced as he leans downwards to where young woman sits on the grass, dressed in iridescent silks with her hair powdered. She twists strongly towards him, so much so that we barely see her face, but she appears to have eyes only for the musician. She holds open a book of sheet music, but the guitarist does not read it. Instead his downcast eyes appear focused on something not visible. The couple's poses, and the way they respectively hold the guitar and the sheet music create a strong central diagonal that both unites them as the main subject and separates them by a sense of physical tension. Moreover, though they are oblivious to anyone else, the couple is not alone. The sculpted bust, turned slightly to the right, draws the eye to secondary figures in the middle ground and the far background, all of whom are engaged in their own pursuits and paying no attention to the main couple. 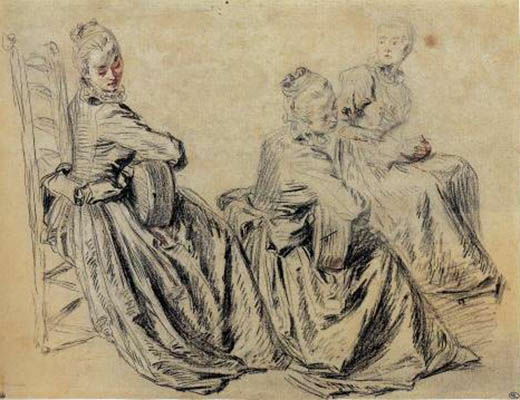 Artwork description & Analysis: Watteau's silvery sketches depict three studies of the same model. Viewed from left to right, she is first seen seated in a wooden chair, playing a guitar. The twist of her upper body is emphasised by the sharp turn of her head, and as she looks over her shoulder, her eyes cast down. He then repeats this pose from a slightly different angle. Finally, he depicts her seated, slightly in the background, holding a musical score and looking off to her right, as if distracted or expectant. The model is dressed throughout in a jacket with rolled tails and a fluted ruff, and each pose suggests that she is listening to music rather than playing an instrument, or singing. 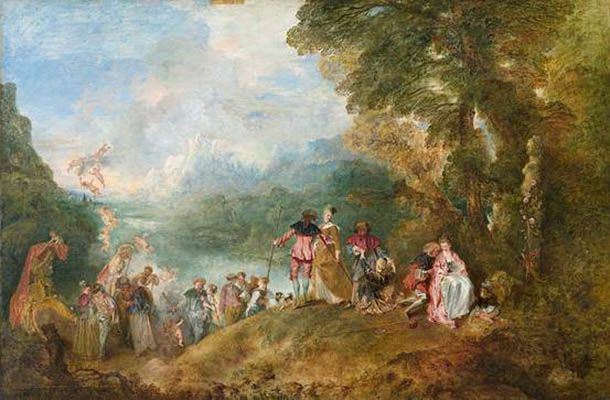 Artwork description & Analysis: Painted over the course of five years, and generally held to be one of Watteau's masterpieces, this ambitious canvas - which is approximately seven feet wide - shows a group of elegant travellers preparing to sail in a fantastical rocaille boat (left foreground) for the island of Cythera, the supposed birthplace of Venus. The figures are paired off in couples that alternately flirt, entreat, engage, and conjoin in a quest for the ideal love that presumably awaits them at their destination. The figures run across the composition from right to left becoming more distant, and less individualized as they progress. Accompanying them are half-draped oarsmen and a swarm of putti that twirl above, signalling joy and anticipation. Watteau painted the picture in lemony, Venetian tones that offset the opalescent blues of the vast sky and contrast with passages of vermilion in the costumes. Watteau's quick, delicate impasto brushwork, overlaid with many layers of thin, varicolored glazes creates a hazy, dreamlike atmosphere that, along with the low horizon line and the swell of landscape in the foreground, marks his setting as a utopia: both an ideal place and a place that can never be. 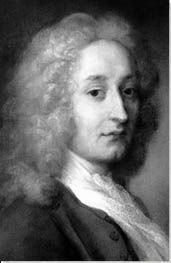 Imagining a fictional version of Watteau in his essay A Prince of Court Painters (1885), Walter Pater described Watteau as "a seeker after something in the world that is there in no satisfying measure, or not at all." 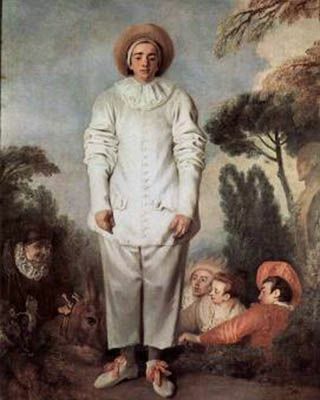 Artwork description & Analysis: Pierrot, the perpetually unlucky-in-love clown, and a stock figure in Italian commedia dell'arte theatre (his counterpart in the Comédie Française is Gilles), stands nearly life sized, encased in a costume of gleaming white satin. 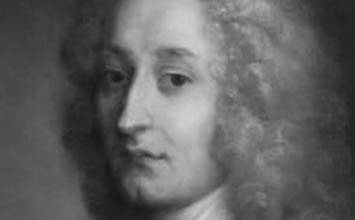 His wistful expression and monumental presence, seen slightly from below, is wholly frontal, suggesting that the figure may have been painted from life, rather than Watteau's imagination. While Watteau experienced performances of the various troupes in Paris at the time, and even made sketches, many of his commedia dell'arte subjects were pastiches, arranged from studio sketches of models dressed in costume. At Pierrot's feet in the middle ground, are four more stock characters (the Doctor on his donkey, the lovers Leandro and Isabella, and the Captain), all shown half-length, standing behind the stage. In fact, Watteau's setting is deliberately theatrical and far more removed from reality than his usual idyllic landscapes. Only a few cypresses and umbrella pines frame the figures and hint at a Mediterranean setting. At the far right a somewhat sinister sculpted bust (perhaps Pan or a satyr) leers at poor Pierrot, a possible reference to his romantic failures. 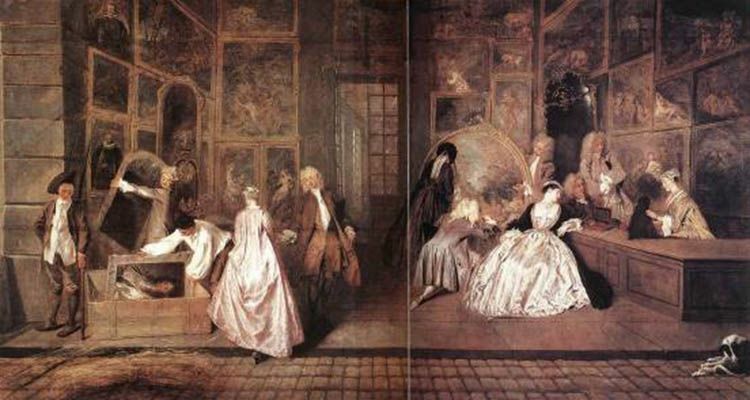 Artwork description & Analysis: Watteau painted his largest work - and one of his very last paintings - as a shop sign for his close friend, Edmé-François Gersaint, a Parisian art dealer. Measuring just over ten feet, the painting shows a dramatically expanded panorama of Gersaint's Paris gallery. Capturing most aspects and follies of the newly emerging art market, Watteau painted eight men and four women of varying class, status, and artistic engagement, arranged frieze like and relatively close to the picture plane. The overall effect is theatrical, as if the act of buying and selling art were a performance. Reading left to right: a young porter stands before a stonework pillar waiting to deliver the painting another porter packs in a large crate. A gallery assistant behind them moves a large mirror. Standing nearby, an elegant woman dressed in pink silk stands with her back to the viewer watching the work, while her companion dressed in fine wools and an elaborate powdered wig takes her hand and vies for her attention.